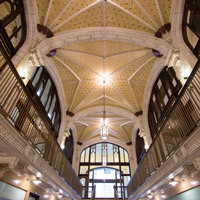 Coverage and vivid photos of the unveiling of Webster's new space in the Arcade Building as part of the Gateway Campus ran in the St. Louis Business Journal. See those photos at the Business Journal site here. See video and additional photos from the event in this Webster story. Low gas prices have been a bonus for consumers and travelers but could be bad news down the road as it impacts oil companies and banks. St. Louis TV station Fox2 interviewed Arnolodo Rodriguez, associate professor of business in the George Herbert Walker School of Business & Technology, to discuss this economic chain reaction. Watch footage of his interview in this Fox2 clip. in Profil, the Austrian newsmagazine. 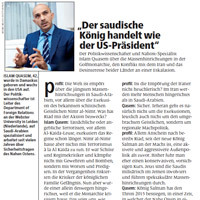 Webster the Netherlands academic director Islam Qasem is interviewed and featured as part of a major profile of Saudi Arabia-Iran relations in the Jan. 11, 2016, issue of Austrian newsmagazine, Profil. The German-language interview includes a Q&A with Qasem on page 47 about the tactics of Saudi Arabia, which traditionally tries to maintain the status quo, as global economic and political dynamics shift around this rivalry. The Orlando campuses' consolidation and relocation to downtown Orlando has received continuing coverage in the Orlando Business Journal, with the latest coverage coming Jan. 11 as contractors are sought to prepare the space for opening in summer 2016. "Environmental Echo," a blog by the journalism students of School of Communications professor Don Corrigan, which highlights the crusade to clean St. Louis air of coal smoke in the mid 20th century, was featured in the stltoday culture blog run by Joe Holleman. "Master the Media: How Teaching Media Literacy Can Save Our Plugged-In World," the new book by School of Communication adjunct faculty member Julie Smith, was reviewed in the January issue of Library Bookwatch.